The perimeter is the first physical line of defence you have against would-be intruders. If you can stop them there, you can protect people from the violent crimes that seem to be a favourite among the South African criminal class. The days of having a perimeter made up of only physical deterrents is long gone, and we now include a variety of security technologies in our perimeter defences. One of these that is growing in importance is surveillance technologies, from visual to thermal cameras placed strategically to find and alert control rooms of an intrusion. As with other areas of the surveillance market, and security in general, there is a vast difference between having cameras on the perimeter and having cameras that contribute to security. One of the key measurements of whether your perimeter solutions are adding value is if they can be used to pre-empt attacks instead of only being used to look for footage afterwards. When looking at what solutions work best on the perimeter, Arecont Vision’s Johan Crause, believes the best combination of electronic product to monitor perimeters would be a mixture of thermal technology, analytics as well as IP CCTV. “The onus is, however, on products to pre-empt possible threats and to treat these expediently,” he warns. Quintin van den Berg from Bosch Security and Safety Systems, adds that with the era of the IoT (Internet of Things) approaching rapidly, Bosch strongly recommends users to standardise on a security system with an AI (artificial intelligence) ready solution equipped with an edge, intelligent video analytics engine. Cameras are no longer just providing an image, but are acting as sensors. He warns however, it is possible to have the best AI, yet if the camera sensor is not providing a clear image the analytics segmentation engine cannot function optimally, AI cannot improve the video system’s performance. The full-time control room monitoring role has changed from the days of operators glaring at multiple screens with the hope of detecting an anomaly. Full-time monitoring has been supplemented and even replaced in certain instances with VMS software that will detect, analyse, classify and alert when integrated correctly with IVA (Intelligent Video Analytics) at the edge. Additionally, conventional optical video cameras – even the most advanced high-definition versions – reach their limit when it comes to detecting intruders under extreme conditions that cause limited vision. Examples include smoke, fog, dust, mist or spray from bodies of water, heavy rain or complete darkness. Camera selection is critical in relation to the environment it will be operating in, be it a thermal, dual thermal or extreme light applications. He says it is always beneficial to consult a professional prior to investing in a video surveillance solution. 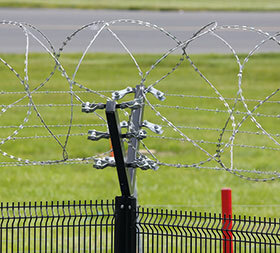 The benefit of a physical perimeter solution, such as a wall or fence, is that it can be complemented by additional functionality to keep the intruders busy while a response team gets to the site. When looking at surveillance on the perimeter, Crause says these systems can only serve to detect, delay and notify of possible threats. It is therefore critical to design and configure the solution to quickly detect breaches and get security personnel on the spot as quickly as possible. A benefit of surveillance, if you have the right setup, is that PTZ (pan, tilt, zoom) cameras can also track the intruders once they move past the perimeter, providing personnel with more information to track and apprehend the suspects. Again, the design and configuration of the system, is the make-or-break component of success. So what are we looking at when considering cameras on the perimeter? How many megapixels are enough, or is there more to the selection of the right camera? Crause notes that brands that have high frame rates, good warranty agreements are generally well accepted in these environments. However, the field of view also needs to be determined in accordance with what the target objective is. When standardising on thermal cameras, he advises users to investigate (via a shoot-out) the level of actionable image that the data delivers, even in situations where natural barriers such as shrubbery obstruct the field of view. Another value-add to look out for in perimeter cameras is the easy set-up and calibration, for example, built-in gyro sensors which helps configure the camera’s pre-loaded analytics by gathering the most important parameters automatically. Users are merely required to enter the height of the camera and the configuration process for the on-board analytics to complete. In terms of software, van den Berg says stick to the important stuff: data security, compatibility/openness, redundancy and how the software alarm management can improve your perimeter security with the video analytic outputs, including the metadata forensic searching. It’s an old question, but one that is still as relevant today as it has always been. In a situation like this, does one opt for a solution from one company to ensure that the cameras, analytics and management software work together seamlessly – and to ensure there is one person to go to when something goes wrong? Or should the end user examine their options and then adopt the best products in each category as suits their requirements? Initially developed in direct cooperation with the Bosch Automotive division, Intelligent Video Analytics – and the more streamlined version Essential Video Analytics – are at the core of Bosch’s mission to deliver the most relevant image data through built-in analytics. Created with the fact in mind that less than 10% of available video data is ever used as actionable intelligence, Bosch video analytics software has proven such a powerful asset to security operators that, as of August 2017, it is now a standard feature. Bosch cameras from the IP 4000 to the IP 9000 series include on-board video analytics as standard, rather than as an optional feature – with no additional investment or licence fees required. Intelligent Video Analytics has proven highly successful in ruling out false alarms that are especially prevalent in challenging environments prone to snow, wind, rain, hail, and water reflections. Paired with the DINION IP thermal 8000 camera’s weatherproof abilities, Intelligent Video Analytics can see through challenging conditions at the frontlines as the first line of defence. In the bigger picture, the DINION IP thermal 8000 camera is a key step in Bosch’s mission to provide operators with the most relevant image data possible. And while it marks a new level of early detection at previously unattainable distances, there is a caveat: The DINION IP thermal 8000 camera is not a stand-alone replacement for visible light cameras, but plays a supporting role in creating an unmatched level of security in existing systems. As the next step in joining Intelligent Video Analytics with thermal imaging, Bosch has released another new moving camera, the MIC IP fusion 9000i camera – boasting both thermal and optical camera capabilities. Much like the DINION IP thermal 8000 camera, this new high performance camera has the ability to detect thermal movements, but is capable of serving as a complete solution with the ability to automatically detect triggers in images captured in the most extreme conditions, through smoke, in complete darkness or when objects or people are obscured by foliage thanks to the dual cameras (thermal and optical) found inside. The fact of the matter is that perimeter defence is not something surveillance solutions can handle on their own. With today’s technology, users can add in audio warnings or challenges to intruders, but the ability to delay and defend is lacking. However, cameras on the perimeter do offer an additional layer of security to the physical defences, such as an electric fence, in that response teams can be sent to the location as soon as a problem occurs, in full knowledge of what they will be facing. Additionally, in certain instances, the footage recorded can be used as evidence. The use of thermal cameras on the perimeter has increased dramatically over the past few years in light of the dramatic decline in pricing, and this is set to continue. Leaving intruders with very few places to hide and security operations with more eyes on the ground 24x7, in any weather and lighting conditions. • Arecont Vision, +27 (0)82 553 9338, jcrause@arecontvision.com, www.arecontvision.com. • Bosch Security and Safety Systems, +27 (0)11 651 9600, security.systems@za.bosch.com, http://africa.boschsecurity.com. The MIC IP fusion 9000i is a ruggedised IP PTZ camera from Bosch, with an advanced PTZ surveillance platform designed to provide early detection in mission-critical applications.